The first of the spring’s new leaves are beginning to show here at Sun Rising. With periods of unseasonal warmth this year, spring has started early, daffodils and cowslips flowering a few weeks earlier than we would otherwise expect. Such indications of climate change can be unsettling, but the heart is still lifted by the bright soft greens of the first trees coming into leaf. Unusually, the guelder rose is one of the first this year – Viburnum opulus. 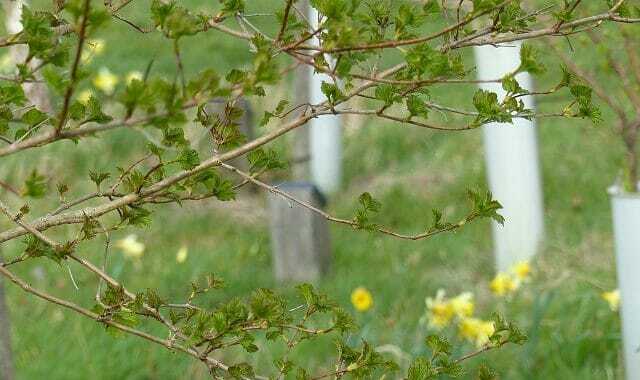 The one you see here, with the wild English daffodils (Narcissus pseudonarcissus) and wild primrose (Primula vulgaris) in the background, is an eight year old memorial tree in Peter’s Wood. 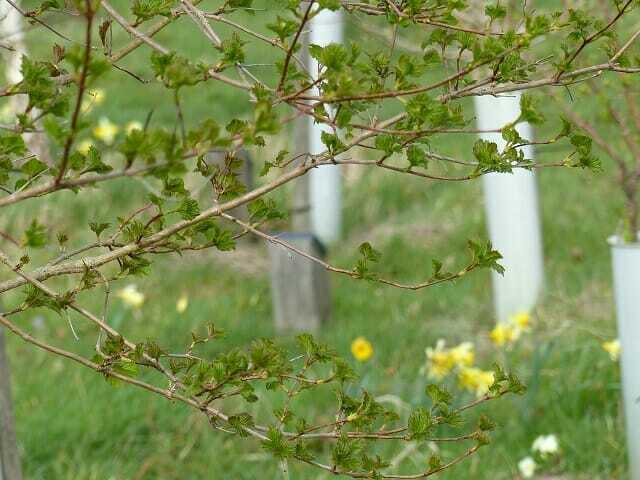 The bird cherries (Prunus padus) are starting to leaf too, as are the first of the hazels (Corylus avellana), with dog rose and honeysuckle leaf buds about to break. The winds have been ferocious, but most of the trees are doing well. In many ways the winds test the young saplings, giving them the flexibility to cope with storms as they grow and mature.